Drake temporarily distracts us from tonight’s Grammy Awards (where he’s already won Best Rap Album) with the video for his new single, “Started From the Bottom”. The Little X-directed clip stays pretty true to its name, depicting Drake’s rise to stardom. There’s also bit of humor provided by two drug store clerks. Check it out below. 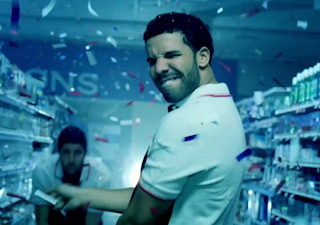 “Started From the Bottom” is the first single off Drake’s as-yet-titled third LP. Update: The album is titled Nothing Was The Same and will be released this summer through Cash Money/Young Money/Universal Republic.